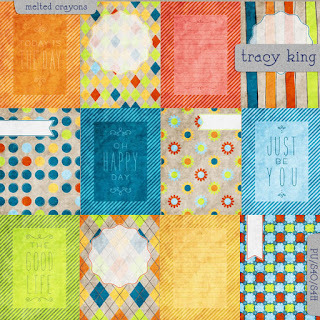 I created some journal cards to match the other Melted Crayons things. I hope you can find some use for them. I try and try to use them myself but seem to be in need of a journal card tutorial ha ha. I haven`t done any project life layouts yet but whenever I see them I think of how lovely they look and how I should try it. I would really appreciate it if you leave a comment with suggestions of what you would like to receive free next. Do you want more melted crayons stuff? or do you want a new and different kit? Download here or by clicking on the preview. You mentioned something about Modern elements but I don't see them. Thanks for the input Sherry. Yes I will create all of those things. Look for them sometime Tuesday (I'm out of town tomorrow and Momday). Have a super weekend and thanks again. Thank you so much ! This is a wonderful kit !